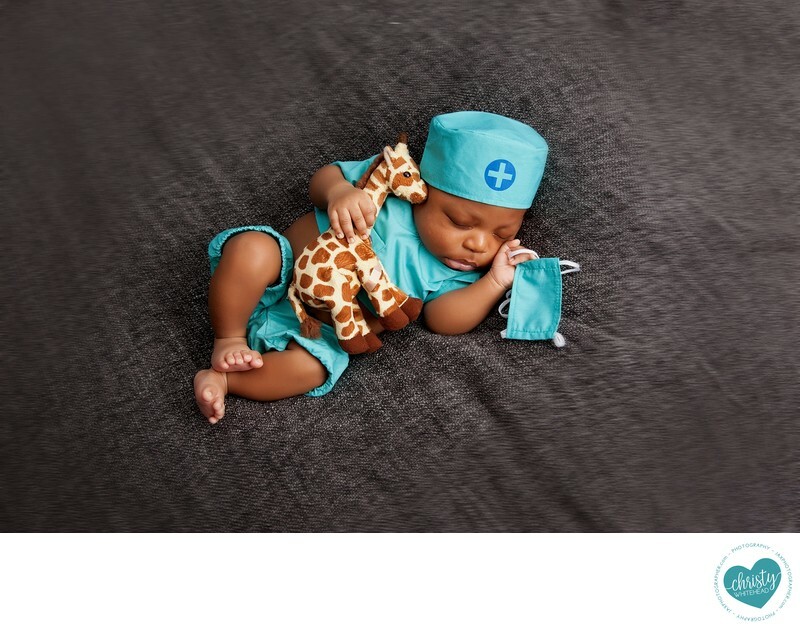 Little Doctor With His Sick Giraffe, Cute Newborn JAX - Newborn Photography | Schedule Your Newborn Shoot Today! When I sit down with new clients during their consultation, my goal is to create a personalized newborn photography experience. Sometimes that includes incorporating a few different elements from their lives. When this sweet boy's parents came into the studio I found out his daddy is a doctor. I also learned that he had a jungle themed nursery full of animals at home. So of course, it was only natural that we incorporate the two together for this newborn photos. From his tiny doctor uniform (complete with a face mask!) to his itty bitty giraffe with a bandaid, the entire photo is a reflection of their family. I loved the way it all came together. Not all themed photos need an elaborate set up. For his photos, we wanted to give a small nod to the theme and his daddies profession while including classic, timeless backdrops. Other themed newborn shoots I have created include Disney, Star Wars, Winnie the Pooh, Mermaids, Law Enforcement and even Toy Story. I would love to hear your ideas for a themed newborn shoot during our consultation!